I had dinner with my friend Isaac the other night. He has a job he doesn’t love, and he’s thinking of making a change. He’s in a comfortable place now, but he wants something more. He’s hesitant to give up what he has now to make the space for something better, to take a leap of faith. In the context of our conversation, Isaac was alluding to the freedom he was seeking by overcoming the fear of the unknown in his future, but the quote means much more to me than just that. If I were to look back on my 29 years on this planet, one major turning point was when my friend Kristie gave me her copy of Fear No Evil: The Pathwork Method of Transforming Your Lower Self. I don’t think any one book has had a greater impact on how I live my life. The concept that book introduced to me was the paradigm of a higher self, lower self, and a mask that shields the higher from the lower. All of us have a higher and lower self. Our higher self is who we are at our best, the version of ourself we aspire to be, encompassing all our best traits and attributes. Our lower self is who we are at our worst, all the parts of ourself we wish we weren’t, our faults, our least desirable characteristics. Standing in between our higher and lower self is our mask. The mask is made up of shame, embarrassment, guilt, and most of all fear that combine to shield the lower from the higher self. It’s only when we’re able to push our guilt and shame out of the way that we’re able to connect our lower and higher selves and be who we are truly capable of being. Removing our mask is a lot easier said than done. Acknowledging your lesser traits certainly isn’t fun. It requires a lot of self-acceptance, patience, and most of all courage. There are few things more scary than taking an honest look at yourself and owning up to what you see. Identifying with all the undesirable, awful things we’re capable of being can be an awful feeling, but it’s the only way we can improve them. It’s only when we take an honest look at ourselves with a spirit of self-discovery and self-love that we can become who we aspire to be, and that takes courage. 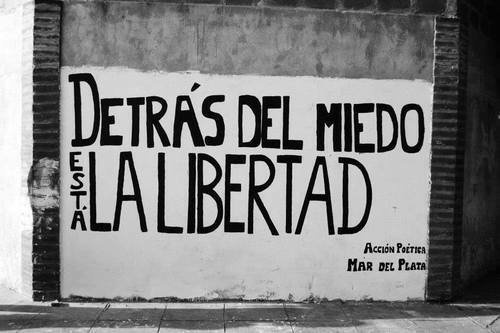 Behind our fear is our freedom.